After our class discussion about Chicago’s growing concern of violence that resides within the inner city, I caught myself questioning the source of influence of this issue. I watched a Vice documentary about rap artists that made it out of “Chiraq”, a common term used by people in the inner city to express a comparison between Chicago and Iraq. Within the video, a teenage boy and his family from the South Side were interviewed on their thoughts of Chicago’s violence. The boy voiced some very insightful opinions that blamed Chicago’s rappers for having a new modern influence that provokes the consistent violence in the city. The boy explained, “It ain’t enough people rapping about positive stuff…you know by this type of music making it to the industry, now everybody in Chicago thinks they gang music can make it into the industry.” The boy knew himself the negative affect these rappers have on his city, but he also felt that the only ticket out of the impoverished city streets was the ganbanging-associated rapping. The meaningless lyrics and sometimes catchy beats that we may hear (referring to anyone not from the inner city) is music that Chicago’s youth affiliates itself to. It’s referred to as “drill” music and its popularity soared in mid-2012 when its presence on the Internet began. 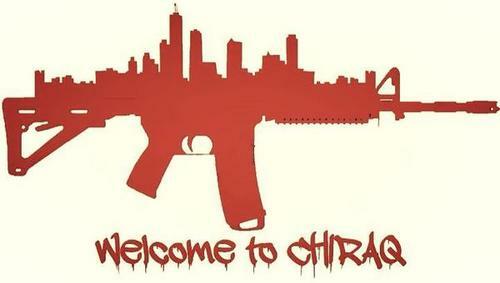 Drill music and the rappers associated to it have only made Chicago’s violent nature grow worse. Many of Chicago’s big names in the rap industry have used their status to produce positive change in the society that raised them. One artist, Chance the Rapper, led the social media campaign "#SaveChicago" that ceased gun violence for 42 hours in the city. Just like Chicago’s youth can relate to their icons, Chance the Rapper can relate to his childhood being clouded with memories of losing his friends to violence. While being interviewed, Chance explained, “It’s just crazy because I have a few friends that were older than me, but now I’m olderthan them.” Contrary to Chance, by listening to any song made by notorious Englewood rapper Chief Keef, one can conclude his strong interest of drugs, violence, guns, and money. Not all rappers realize the influence they have on their city and they continue to glorify their lifestyles that brainwash Chicago’s youth into thinking it’s the only lifestyle to live. Trying to put my own local perspective into context, I thought about how everyday when I walk to advisory I pass the wall with the pictures of famous New Trier alumni. Without it being actually said to me, I am being shown in a covert fashion the expectations and the people that I am supposed to live up to. I feel that the same concept is associable to Chicago’s inner city kids. Without noticing it themselves, they are being told how to live in order to acquire fame through the music that encompasses their society. Filled with young minds that are optimistic towards anything that can get them out of one of the most dangerous cities in the country, Chicago’s exceedingly violent activity is urged by it’s youth following the dangerous lifestyle that certain hometown rappers preach.